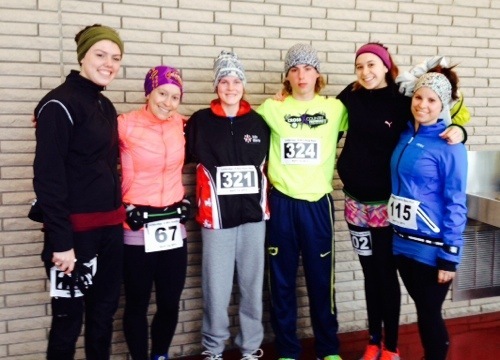 10 mile road race | Je Me Souviens-To Infinity & Beyond! My training for Boston Marathon has been winding down, and with about a week and a half to go, I still had a 10-12 mile workout to deal with. I decided to register for the local 10 Mile Road Race (which I have done two other times, here in 2013 and here in 2014) and push myself to the max. While some people training for a big race like Boston, or any marathon at that, may not want to push themselves all out in an event less than two weeks prior, I needed this. I need the competition, the motivation, and the chance to see how my foot held up. In the end, I am so happy I did! I really had no idea how my splits were going to be, I was just going to push until I needed to pull back. Ideally, my goal was to make sure to beat my time from two years ago; 1:14.49. I knew I was faster and stronger than two years ago, so I knew I could do it. I also really wanted to place in top 3 females, so I could earn some prize money to take to Boston. 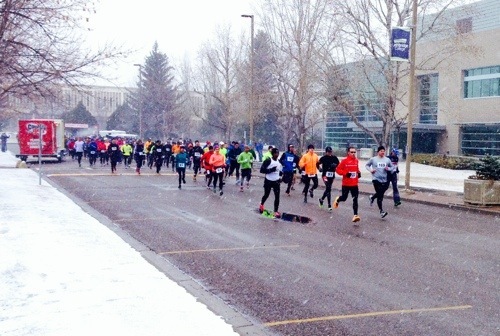 Race began and I started strong for first three miles. Very strong, and very concerned. Was I going too fast? I was trying to just keep with a group, as it seemed like myself and another woman were the natural ‘break’ before a big gap behind. I didn’t want to be running solo during this thing. The course is out and back on Scenic Drive, down to the river bottom, turn around at the bridge, and back. So it is a very downhill course for the first portion, then a stupid climb back up Lynx to get on Scenic for the last 2.5 miles. My first four miles (which include the steep downhill into the river bottom) 6:53, 7:03, 6:53, 6:44. At this point I was 2nd female, with the 1st female quite a bit ahead. She was ahead of my friend Bob and I knew unless she had a total collapse I probably couldn’t catch her, but second place was my spot to lose. I had some extra energy sent my way when I passed my colleague and co-coach from Cross country, Don, and two students, who had ridden their bikes to the river bottom to cheer on the runners. I got to see them again after the turnaround and it helped tons. My splits in the river bottom were 7:11 and 7:20. At this point I had been approaching the 250 feet + elevation climb of Lynx. I have not been doing enough hill training, and I felt slower up this hill than I have in the past. I knew I needed to keep pushing and hold my position, so even if I slowed down I didn’t want to walk. I knew the splits would be much slower, but I wanted to have energy for the last miles on Scenic. I hit miles 7 and 8 in 8:08 and 8:14. By the time I made it back on to Scenic it did feel like I was running solo on a training run, albeit A LOT faster. Big gaps between individuals. It helped catching up to some of the participants in the 4 mile portion of the event who were walking, as it gave me people to focus on. The volunteers at the cross walks also helped me keep on moving. I ran mile 9 in 7:28 and then finished mile 10 in a strong 7:05. My final time—1:12.59! 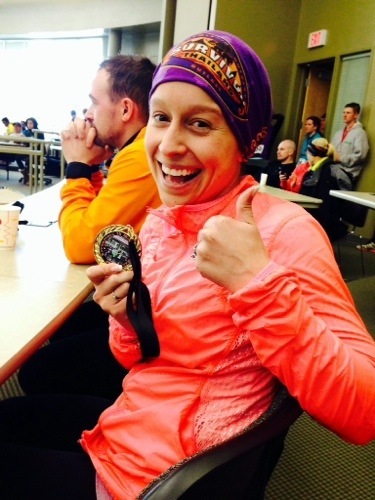 I held on to 2nd place female, beat my time from two years ago, and even snuck in to the 1:12s! After finishing, I felt great. 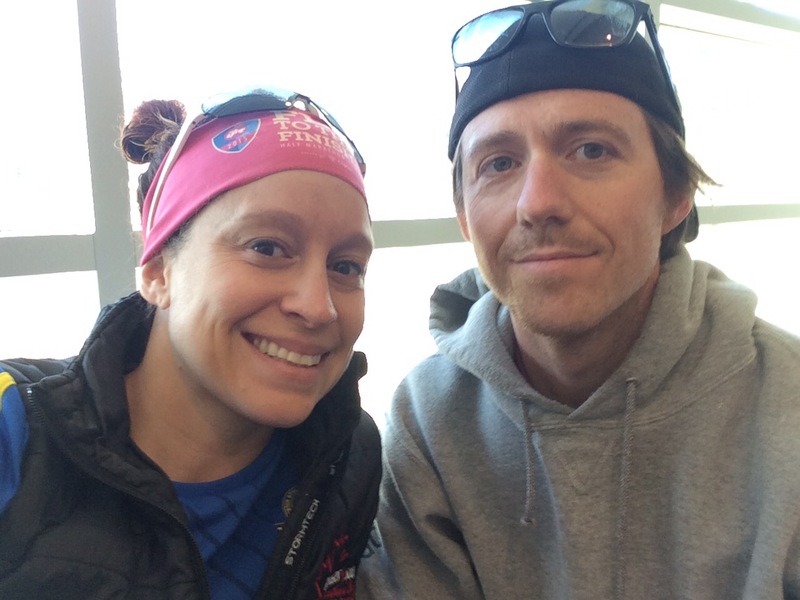 I was not ready to collapse, and felt like I could have done three more miles. Which would have been a half marathon. And then potentially a personal best. Have I been doubting my speed and ability and not really pushing myself to my full potential? How fast should I be going at Boston? My foot isn’t really holding me back, its my mind! Awards were great, because I truly love being around my running family in Lethbridge! They presented 4 mile awards first then the 10 mile. 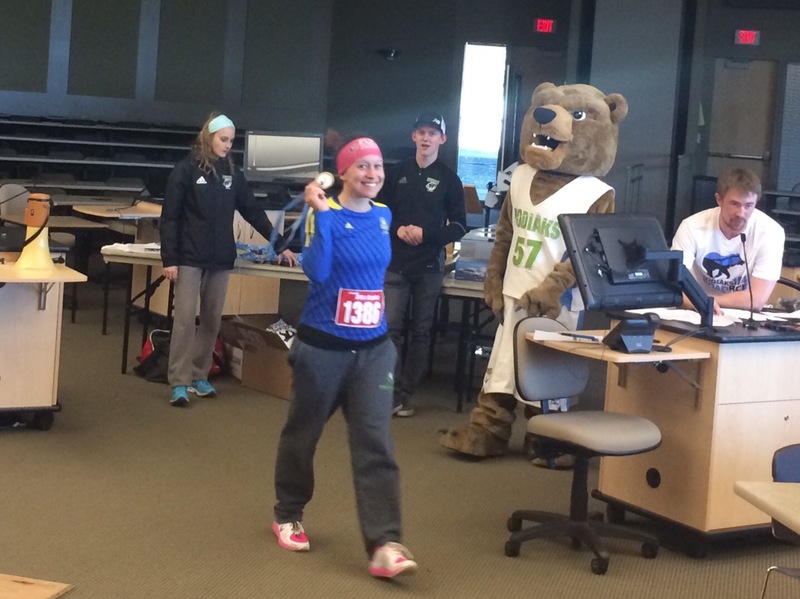 For being 2nd female I was awarded with $150 cash and a hug from the Lethbridge College Kodiak! Age group awards put me in 1st for 30-39. By the end of the awards, I had gotten the pictures I wanted, my car unlocked, and my confidence boosted. Boston, here I come! 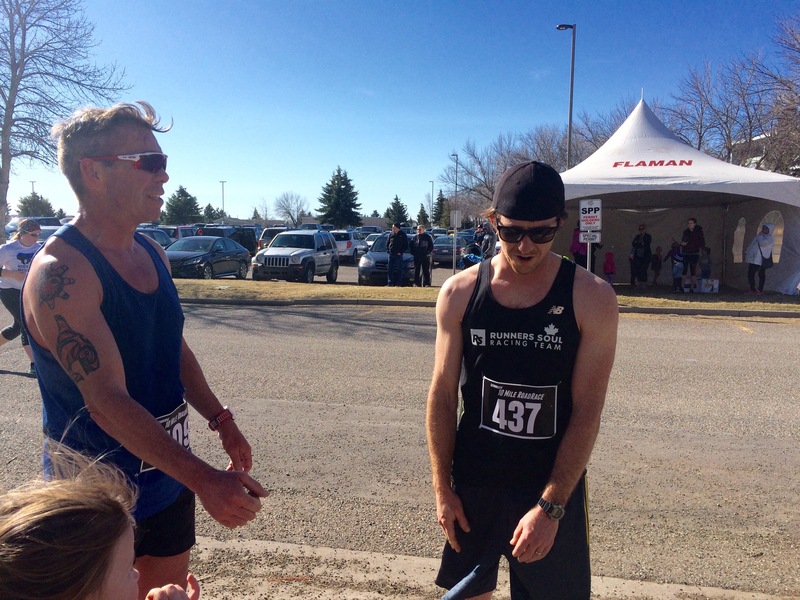 Lethbridge 10 Mile Road Race-Race Recap! 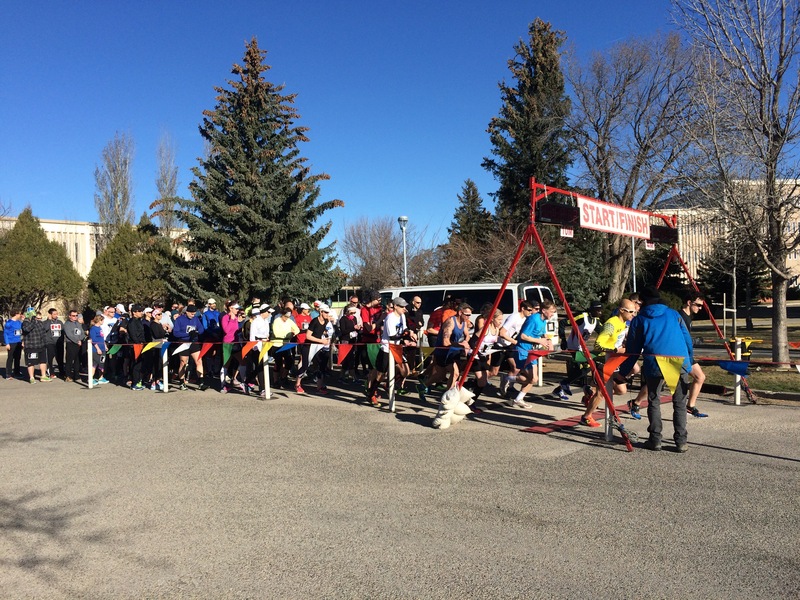 April 12th, 2014, marked the 41st annual Lethbridge 10 Mile Road Race. I ran this event last year for the first time, (you can find that recap here) and really enjoyed it. 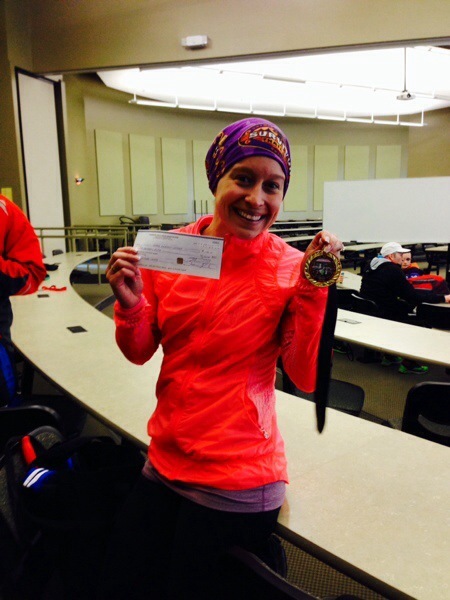 Last year, this event marked the first time I ever placed in my age group-2nd place! For the first time since high school, I had actually felt like an athlete! 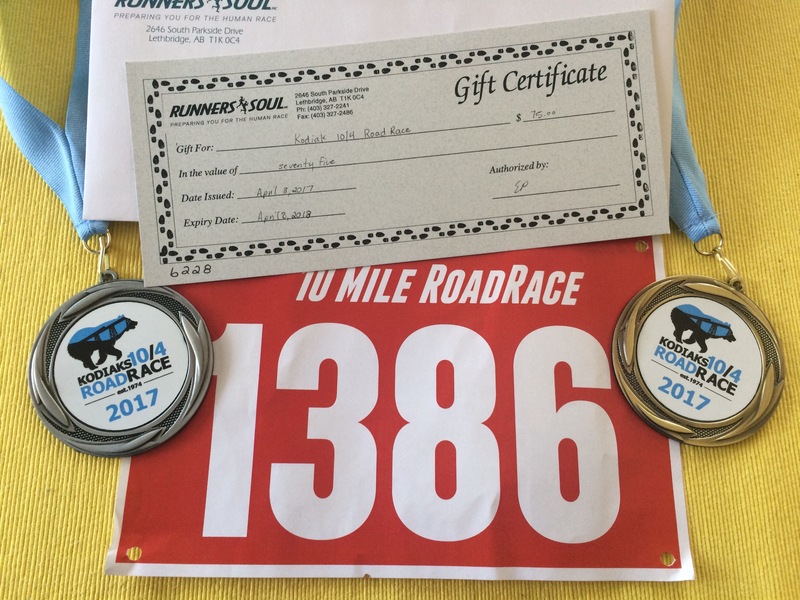 Going into the race this year, I knew I wanted to beat last years time (1:23:14) and also attempt to still place in my age group. I had also been quietly promoting this event at school to students, as they do a 4 mile event also. 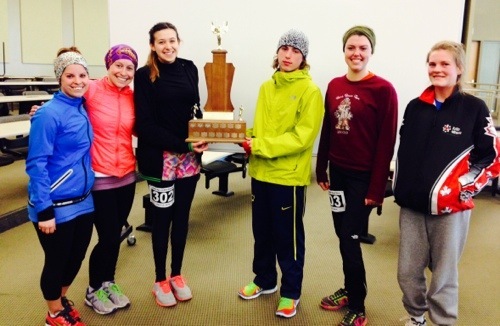 Runners Soul awards a school participation award and a high school challenge trophy. Four of my cross country athletes registered for the event! 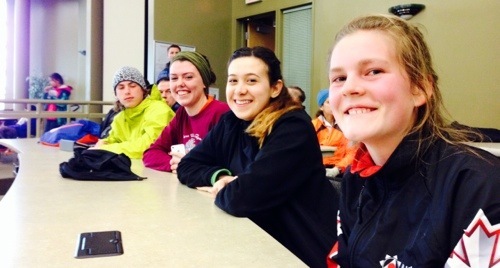 I met with them before my 9:00 am start time to chat and get them fired up to run in the ridiculously gross weather. Their event began at 9:20, so I told them we would meet up afterwards during awards. 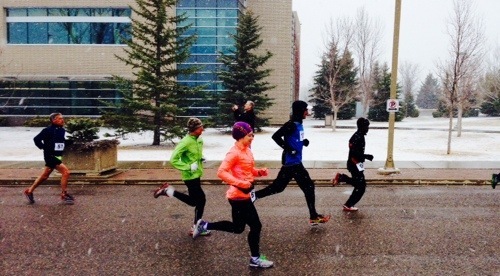 The wind was cold, the snow flurries were blowing, the air was crisp–for me, it was perfect running weather! It could have been worse! Pouring rain, sweltering heat or as cold as it was a few weekends ago during my Run For L’Arche in Calgary…those would have all been worse. I left the start line with a burst of energy and determination-here goes nothing! The course is out-and-back, taking the 10 milers down Scenic Drive to Lynx Trail, which leads you down into the river bottom. Runners would wind through the river bottom adjacent to the Old Man River, and eventually turn around once you near the High Level Bridge. The course was the exact same as last year, so I knew what I was getting myself into. As I proceeded onto Scenic Drive, I met up with fellow Marathon Club member Bob H. I have ran with him at club before—he really books it during training runs with his daughter in the jogging stroller!—and also most recently saw him at the Coaldale 5km. He ran a 1:22 last year and told me he also wanted to beat that time. I figured following him while I could would be a good pacing strategy for me! I made sure I always ran on the inside “lane” when we were side by side, because as I have said before, my 5’3″ stature doesn’t always provide the best stride length. I need to hug the curve when possible! After the first three miles, I had ran a 6:50, 7:39 and 7:31. I was booking it, and Bob even mentioned the crazy idea that I could get a 1:15:00! I was thinking that as we descended into the river bottom, and for a moment got discouraged as a handful of people plowed past me. I am very hesitant going down this hill, as I know how steep it is. It is over half a mile downhill, and if I were to go too fast my legs would be feeling it and hurting once I hit level ground. When I made it to the bottom of the hill, I made a conscious effort to lengthen my stride and make up ground. I was able to catch mostly everyone that passed me on that downhill. I then set my focus forward to make it to the turnaround. At the 5 mile turnaround, I felt great about my position and pace. I was able to see at that moment I was actually the 2nd place female runner! I knew I needed to keep my pace down in the valley, and really give it on the hill back up to Scenic. Before hitting Whoop-Up Drive, I saw my fellow teacher and her husband running to the turnaround. It was a great energy boost to see Amie and Morgan! When I reached the 6 mile mark, and the hill climb was my next obstacle, I had ran a 7:01, 7:23, and 7:24. Hill training is a necessary evil. I don’t like it, I don’t think anyone really does, but man does it pay off. I have done this hill so many times before on training runs and races that I knew what beast I would be tackling. At the midway point where it flattens out a bit I even picked up my pace the best I could. I kept my head up and made it up that hill with a slight smile on my face, as I knew that now I was back on Scenic Drive and the last three miles would feel easy compared to that incline. My seventh mile clocked in at 8:52. Even though the hardest climb was done, the last three miles had to still be tackled with gusto. I didn’t want to lose my pace, so I kept my head forward and focused on that goal. I ran mile 8 and 9 at 7:43 and 7:24. The 7:24 was a huge confidence boost because I was able to get back near to my most consistent pace times. During the last mile I knew I wanted to hold my position, but also knew I could get that glorious 1:15:00! I used everything I had left as I wound through the College grounds to the finish line, running my last mile in a time of 7:03! I finished the race not only beating my time from last year, but clocking in at a 1:14:49! I was shaking with adrenaline as the volunteer took my timing chip off my ankle-I was overjoyed! Two of my students were on the side of the finish line stretch, and I heard them cheering when I came down, so I went over to see how their race went. They both agreed it went well, but they hadn’t seen the results yet. When we headed inside, we ran into one of the other kids, who felt really great about his race. After finding the results for the four mile, it was awesome to see that all four of the kids did fantastic! 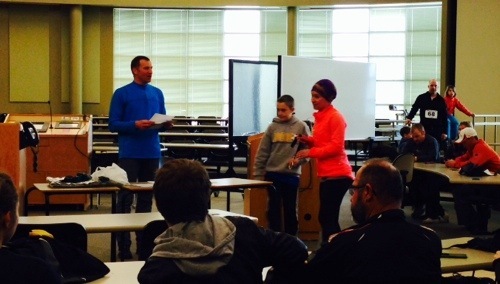 The youngest girl in our group, Morghan, had improved her time since cross country season by a lot! Bacho has been running a lot on her own after school since cross country season and also had done the Moonlight Run, so she was quite pleased with her time too! Both Kristin and Tyler, cross country athletes who went to Provincials with our team in October, earned age group awards! Kristin placed 2nd in 16-19 females and Tyler also earned a 2nd in the male 16-19 category! The young man who captured first in his group was actually a cross country athlete at the College, and he came over after Tyler’s race to congratulate him, and was surprised Tyler was only in grade 10. We found Amie just before the 4 mile awards, and sat as a school for the presentations. It was inspiring to see all the young kids out there doing the 4 mile event! The youngest age category was 10 and under, and there were 21 kids in total! Looking at the results, the number of kids participating that were 19 and under totaled 41! Kids made up 28% of the four mile event field! Awesome! The part of the awards that almost had me cry (honestly…I’m emotional) was when Shawn from Runners Soul announced the high school team challenge winners. They had started this award back in 2011, and every year the trophy went with Medicine Hat High School. He made this clear in his presentation of the awards and then made it very clear that it was staying here in Lethbridge this year! Winston Churchill High School had claimed the title! The crowds’ support of our WCHS kids was incredible, and it made me extremely proud to be a “northside” teacher. The 10 mile awards followed. I accepted my 1st place medal for my 20-29 age group, and then anxiously awaited my overall award. I had never placed overall before this! At Moonlight Run this year I narrowly missed out an overall award, finishing 4th out of all females. I finished 2/65 in my gender today, and earned $150 as my prize money. Not going to lie, and I am not ashamed to admit it, but I cashed that cheque at Scotiabank so embarrassingly fast after the event. I also called my husband to inform him I was making us dinner reservations at Miro Bistro that night and the dinner was on me! Today the sun is out, the snow is melted, and it is above freezing. There is no wind. The weather is perfect for a Sunday afternoon in April. To the average person in Lethbridge, yesterday may have looked like a terrible, rotten, no-good, very bad day. But I think it was pretty much perfect-I’d give it an 11 out of 10.